Wipe your feet on something stylish with this Scalloped black boot tray from TrafficMASTER. This rectangular shaped rug is a great addition to your doorway. Designed from recycled rubber material with a style for optimal indoor/outdoor use. Constructed from recycled rubber material for durability and style. Made with indoor/outdoor use in mind. This mat is a great addition to any doorway in your home. This Laurel Portland brown utility mat from Cam Living is a stylish way to wipe your feet and frame your door. Its rectangular shape complements a variety of home styles and tastes. This indoor mat is made from synthetic fibre material for a chic, yet comfy feel. Scalloped Black 1 ft. 7-inch x 3 ft. 3-inch Indoor/Outdoor Rectangular Boot Tray Wipe your feet on something stylish with this Scalloped black boot tray from TrafficMASTER. This rectangular shaped rug is a great addition to your doorway. Designed from recycled rubber material with a style for optimal indoor/outdoor use. 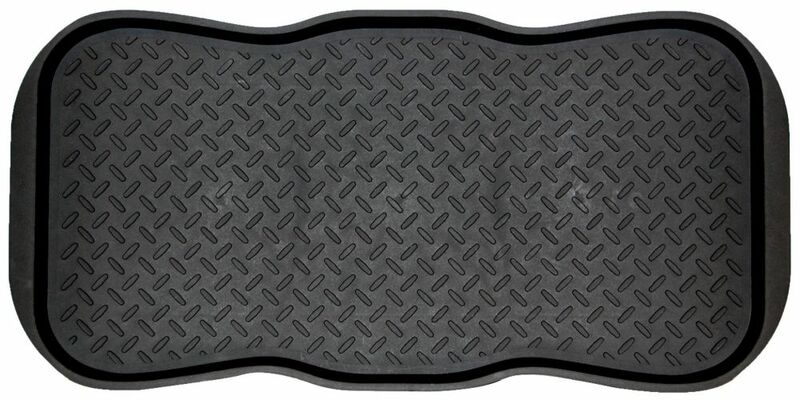 Scalloped Black 1 ft. 7-inch x 3 ft. 3-inch Indoor/Outdoor Rectangular Boot Tray is rated 1.0 out of 5 by 1.